Kollam is a major tourist attraction and trade port of the Kerala. Read more about Kollam and its tourist attractions, in the article. Since ancient times, Kollam district has been considered as a major trading port of Kerala. It serves as the trade route for the merchants of Western Ghats. The region is well known for producing pepper, coir, cashews and other agricultural products. There is significant population of Christian, Hindu and Muslim communities in the region living in peaceful harmony. Like other parts of the state, fishing is prominently done along the coasts of Kollam. There is a belief that once there was a community of Chinese people living here. A marketplace has been named Chinnakada, which is the corrupted version of China Kada (China Market), Kollam. The district has significant number of remnants of churches and forts. It also has a number of old colonial builds, which represent its rich colonial history. Located 6 km north from Kollam town, Thirumullavaram Beach is one of the best picnic spots in the district. It provides spectacular view of the Arabian Sea, along with abundant plantation of coconut palms. The beach is an excellent spot to enjoy a refreshing bath. 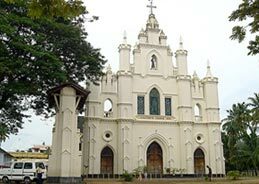 Located 5 km away from Kollam, Thangassery is a place of historical significance. It is home to several important 18th century churches and remains of the Portuguese and Dutch forts. Along with other tourist attractions, there is a 45m high lighthouse in Thangassery. Paravoor is located 13 km south of Kollam and is known for its fishing and coir production centre. Paravoor is currently looking forward to develop a beach resort and a water sports complex to increase the tourism in the area. Jatayu Rock is named after Jataya, the huge bird from the Hindu epic, ‘Ramayana’. As per the legends, Jatayu fought with the demon King Ravana and tried to stop him when he was taking Sita to Lanka. Thenmala is a traveler’s paradise due to dense forest covers of the Eastern Ranges. Visitor can enjoy a pleasure ride while passing through Senthurini Wild Life Sanctuary and can simulaneouly have a striking view of Thenmala Dam. Also known as ‘Queen of Lakes’, Sasthamkotta Lake is the largest freshwater lake in the state of Kerala. Visitors can enjoy the facility of boating in the lake, while enjoying the mesmerizing view of magnificent hills. Located 73 Km east of Kollam, Aryankavu is a renowned pilgrim center of the state. In ancient times, Aryankavu served as the trade route for the merchants of both sides of Western Ghats. It is well known for the shrine of Lord Sastha. This historical temple has several fine sculptures and mural paintings in its premises. Chavara is located 14 km north of Kollam. It is famous for mineral sand found at this place. For centuries, thousands of tonnes of mineral sand have been exported to other countries. The nearest airport is Trivandrum International Airport, which is 71 km away from Kollam. Kollam is an important railway station of Southern Railways. Kollam is well connected with major cities by roadways.